I've also been studying Mucha's art. I love his compositions, his flowing lines and the way he framed a lot of his pieces. It was in the back of my mind while I worked out my design. This piece is now available on my Etsy Store. In my last post I mentioned that I had been watching Terryl Whitlatch's tutorials on Creature Design where she explains the anatomy of various animals and why their anatomy is the way it is. She encouraged us to ask ourselves the why of the creature before beginning a design. One of the assignments was to create a fish hybrid using either an amphibian or reptile, and, in my search for reference for the assignment, I had stumbled upon a ballerina fish that became an inspiration for me. 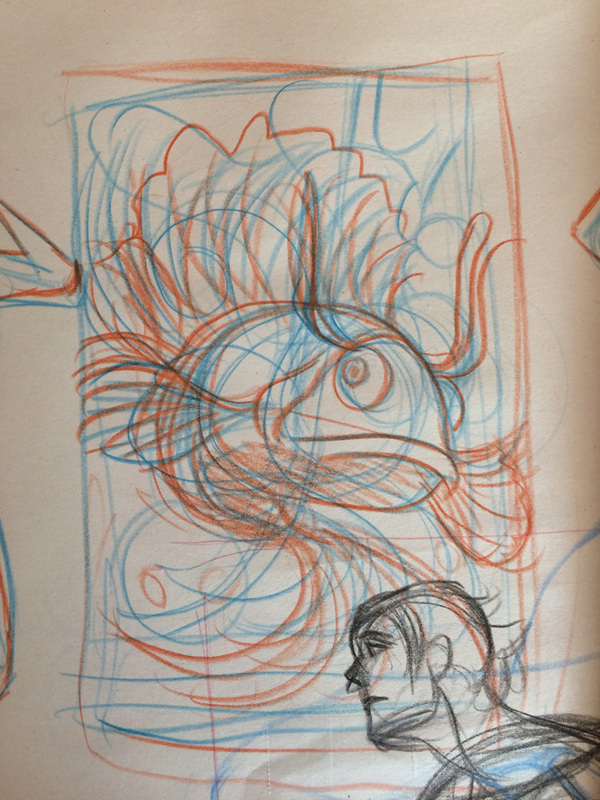 While I was exploring ideas for the first piece from my previous post, another idea popped into my head of a girl with hair made to look like those big flowing fins and so I scribbled it out as best I could. I wasn't sure at first where it would go but the backstory in my mind started to develop. The why of the hair would be camouflage to help her hide amongst coral and seaweed near her home. She became my version of a mermaid. She is pleasantly surprised to find a couple of friendly creatures with some similarities to her, hence the title. As you can probably guess, I'm not very good at coming up with titles. ;) But I keep trying! This is now available as a print and other items at my Society6 and Zazzle stores. On a related note, I should point out who Terryl Whitlatch is. I also mentioned her in my previous post and it had completely slipped my mind that some readers might not know who she is. She is an amazing artist with a background in zoology. She might be best known for her work with LucasFilm, designing many aliens and species for Star Wars Episode 1 and some of the creature re-designs in the re-mastered trilogy. Here are some additional sites featuring her work. Go check them out! I've been watching Terryl Whitlatch's videos on Creature Design, and week 2 was all about creating a fish-hybrid using either an amphibian or reptile as the other portion. In my search for reference of koi fish for the one part, I stumbled upon images of the pinkish-white ballerina goldfish. 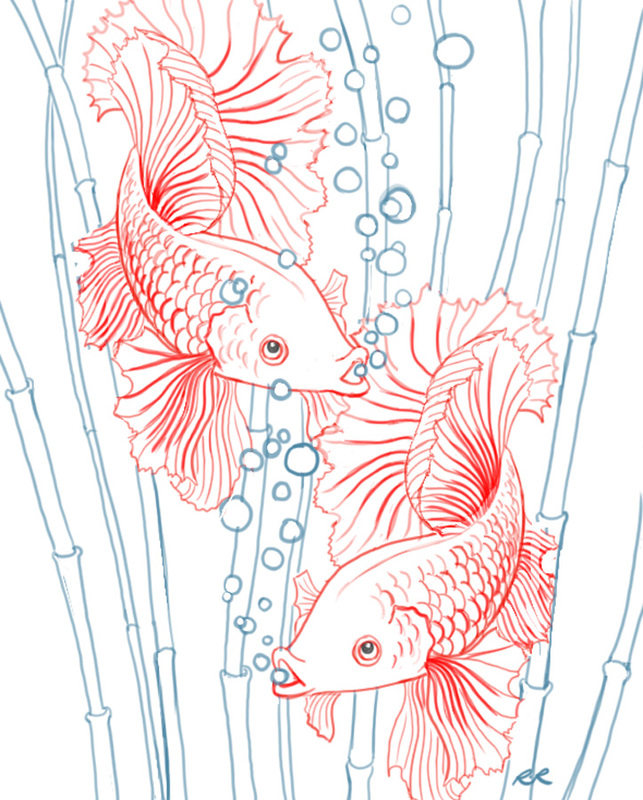 The fish's large but delicate fins make them visually appealing, somewhat like flower petals. So, my initial drawings of koi fish morphed into a ballerina-koi hybrid fish and the homework was temporarily abandoned so that I could pursue this image further. 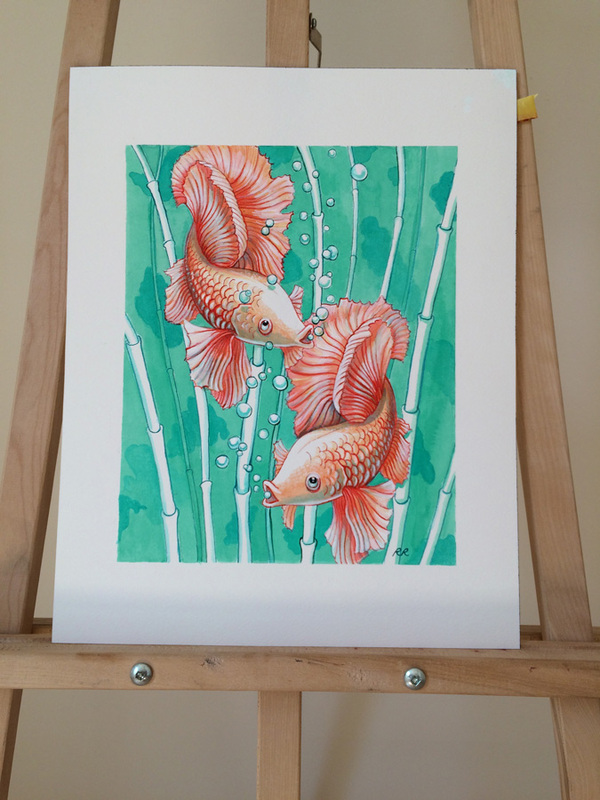 I decided to paint it in watercolour using one of my favourite colour combinations of turquoise and orange. I set about creating rough sketches on paper, then brought it into Photoshop to play with the design before committing paint to paper. I used Dr. Ph. Martin's lightfast indian ink and white acrylic paint. The original will be available for sale on my Etsy store. Regular prints and other items featuring this image are available at my Society6 and Zazzle stores.